LENSES is a holistic planning and decision making system. It employs an ecological framework to bring forward foundational values, establish guiding principles, manage energy and resource flows, and ensure vital outcomes. LENSES, or Living Environments in Natural, Social, and Economic Settings, was initiated at Colorado State University’s Institute for the Built Environment (IBE) in 2007. 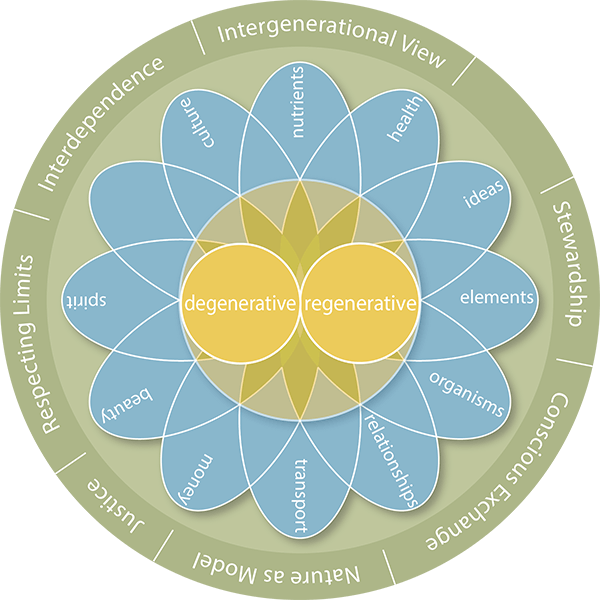 The LENSES framework and application guide has been developed by the Center for Living Environments and Regeneration (CLEAR) to guide dialogue toward a redefinition of sustainability and the creation of measurable, regenerative solutions. LENSES offers a framework to facilitate individuals, groups, and organizations in defining and reaching their fullest potential while taking into account specific natural, social and economic variables. LENSES focuses on and emphasizes a new definition of success called net positive contribution (NPC), and is measured by how regenerative an outcome is. Regeneration is a process of restoration, revitalization, and growth. It differs from sustainability in both intent and outcome, focusing on creating systems that thrive through renewal and abundance. In contrast, sustainability emphasizes maintaining systems through continuing reuse over time. LENSES was developed using descriptive, not prescriptive metrics, allowing for flexibility and encouraging contextually appropriate solutions. It places as much emphasis on process as it does outcomes, providing guidance while supported by meaningful performance metrics. LENSES enables transformational change by questioning underlying assumptions, facilitating dialogue, providing guidance on goal setting and achievement, and cultivating a sense of humanity. LENSES encourages outside-in-thinking by considering intended outcomes, building a vision, and crafting a solution that is personalized to the unique context. This helps shifts the focus from what is to what can be. The LENSES Framework is composed of three lenses: The Foundational lens, the Flows lens, and the Vitality lens (see Figure 1, the LENSES Framework). Together they challenge people to aim for regenerative solutions by striving towards net positive contribution, adopting systems thinking, embracing solutions unique to the situation, and recognizing the interdependence of humans and nature. The Foundation lens provides guidance in establishing a common understanding of regeneration and systems thinking, and agreement on team structure, alignment, and guiding principles. It helps consider the impact of strategies and tactics on the integrated bottom line (natural, social, economic) and vice versa. The Flows lens provides guidance in recognizing and honoring the inherent uniqueness of people’s endeavors. It is comprised of categories or entities that flow into and through the process when undertaking a change activity. The Flows lens is used to assess the past and current state of flows and discover the intersections and relationships between them. This sets the stage for developing goals that are regenerative and for making decisions that are contextually appropriate. The Vitality lens is intended to establish an understanding of the characteristics and qualities that comprise a regenerative outcome or solution. In concert with the Flows lens, this lens guides the attainment of regenerative goals by identifying effective strategies for achieving these goals. The associated Rubrics provide metrics for identifying and determining the net positive impact of decisions and outcomes. Initially, LENSES was developed and used by sustainability professionals seeking to implement progressive solutions and students passionate about making the world a better place. Currently, the LENSES practitioner- facilitator cohort is applying LENSES more broadly, including in the areas of human capital development, organizational management, and the applied sciences. While many of today’s solutions may be considered “sustainable”, they do not necessarily result in net positive contribution. Rather, they simply reduce damage to the environment, humans, or the economy; and often just one or the other of these. There exists a pressing need to move beyond incremental improvements toward a profound transformation. Many decision making tools offer little in terms of guidance through the creation, implementation, and operation of change initiatives. Instead they focus on measuring end results. In addition to supporting performance metrics, LENSES provides meaningful guidance to facilitate the regenerative process. LENSES is more than a tool. It’s a comprehensive platform to guide the collaborative process. The LENSES framework offers great flexibility on how it can be applied. LENSES is designed to support the development of people, projects, programs, and organizations over their entire lifecycles, from initiation, execution, growth, and completion.